May 4, 2011 By This post may contain affiliate links. Everyone loves slippers so why not make this favorite into a treat? 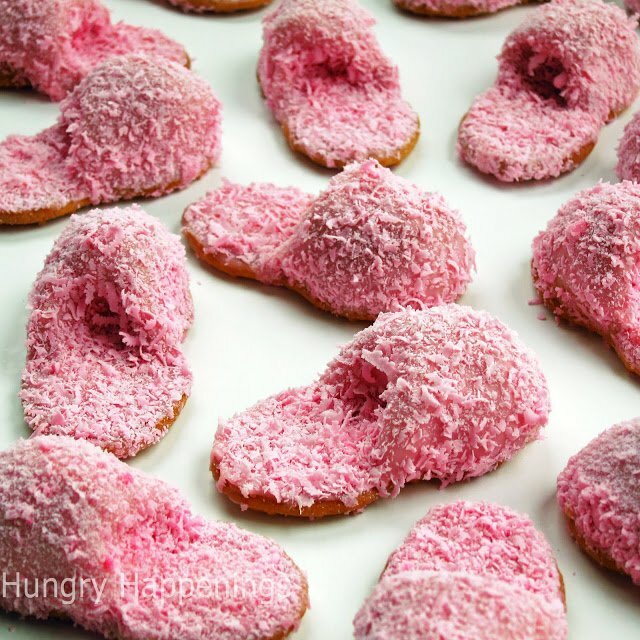 This recipe will show you How to make Pink Fuzzy Slipper Cookies that will make your tummy feel just as warm and fuzzy as the real deal does for your feet! or for a slumber party, spa party, or even a baby shower? One of my friends is a cooking magazine junkie and I benefit from her habit. She really can’t walk by a magazine rack without making a purchase. The glossy covers emblazoned with mouthwatering photos of the newest recipes captivate her attention and before she is even aware, at least one magazine is in her shopping cart. Whenever she comes to my house, she has a few magazines in hand to show me some new discovery.The other day she brought along a Better Homes and Gardens magazine filled with cupcake ideas and she was so excited to show me how they turned Nutter Butter Cookies into flip flops to top a summer themed cupcake. My friend continued to flip through the magazine talking about various cupcakes, but all I could think about was different ways to use the peanut shaped cookies to make some other footwear. I went down the list of shoes – sneakers, pumps, clogs, cleats … then it hit me. Since slippers have a fairly simple design, I was certain I could replicate them using the cookies. I was so excited to get started working on my new project as I thought it would be a perfect idea for Mother’s Day. 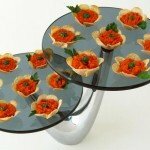 How cute would they look when served with breakfast in bed? That afternoon I ran to the store, bought a package of cookies, and got busy in the kitchen. Each slipper would only require one half of the cookie, so I split the cookies and scraped out the filling. The creamy peanut butter centers tasted very similar to that of the peanut butter fudge used to make buckeyes (a traditional candy popular in my home state of Ohio), so I whipped up a batch of the fudge and mixed in the cookie filling. Yum. 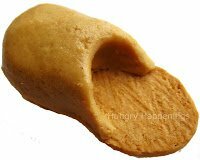 It had the perfect flavor and a small scoop of the fudge set on top of each cookie was easily molded into a little slipper. The next trick was getting the slippers to look fuzzy. I melted some pink candy coating, dipped two slipper cookies, and used a fork to spike the wet coating. They looked odd. They just weren’t fuzzy enough. I thought about using coconut tinted pink, but tasted the cookie with some coconut. Not good. Next I tried sprinkling the pink candy coated slipper with pink sanding sugar. Too shiny. Then I sprinkled on some pink jimmies. Nope. As I was looking around for inspiration, I came across a bowl of shaved dark chocolate that I had used earlier that week to coat some truffles. The chocolate shavings had a nice fuzzy quality, so I grabbed my rotary cheese grater and grated some pink candy coating and sprinkled it over my pink slipper cookies. It was the perfect fit. So, I got to work making a whole batch of slipper cookies. 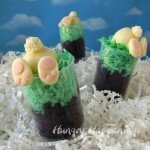 You can even turn these decorated Nutter Butters into cute Bunny Slippers by adding modeling chocolate ears and nose, candy eyes, and edible grass whiskers. 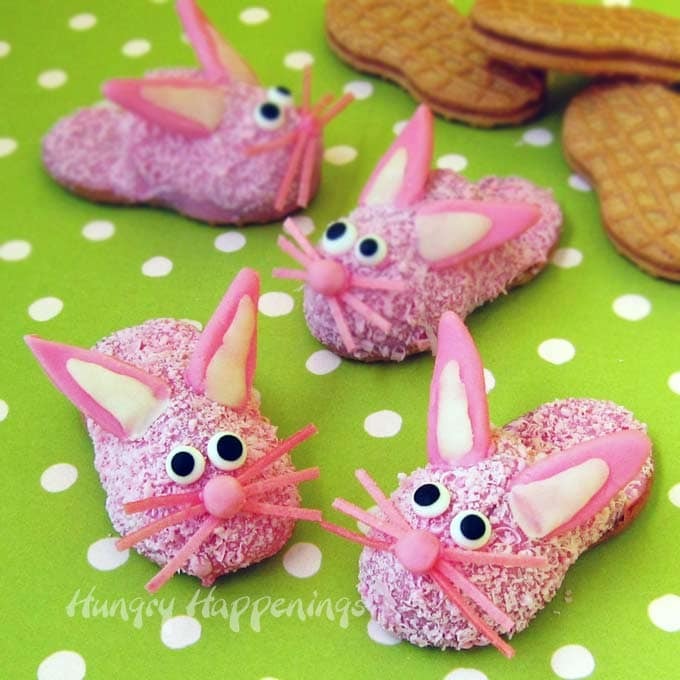 See the directions to make Bunny Slipper Cookies, here. Before you begin, if you don’t have any experience melting chocolate, read my my tutorial on chocolate making. If you can’t find pink confectionery coating / candy melts, you can follow the directions in the tutorial to add pink coloring to white candy melts. 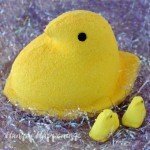 To make the “fuzz” for the slippers, you need to be able to grate some of the confectionery coating. So, you’ll need to pour 2 ounces of the colored candy into a parchment paper lined rectangle container then place it in the freezer to harden. Allow it to come to room temperature, then grate it using a box style cheese grater. You can use this technique if you do have pink candy melts, but don’t have a rotary cheese grater . 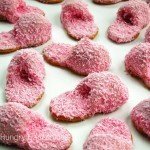 To make these cute Pink Fuzzy Slipper Cookies you’ll need some supplies that you can find on Amazon (commission earned for affiliate sales). 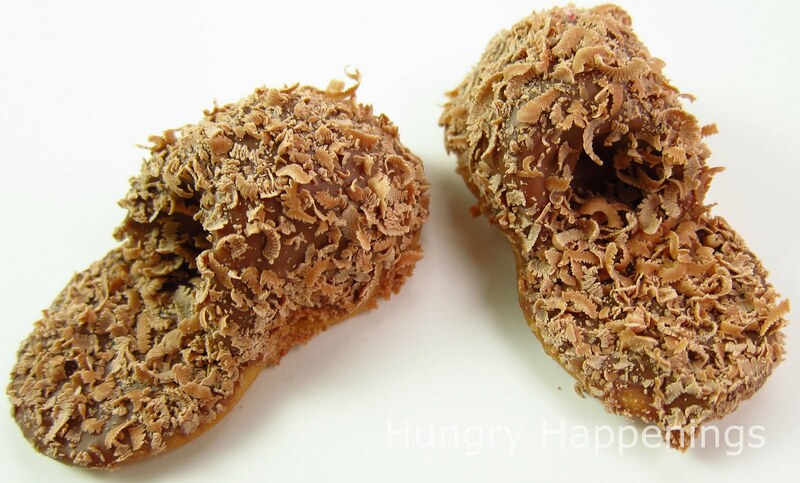 Pull apart the two peanut shaped cookies. Scrape the peanut butter filling off of each cookie using a knife or spatula, not your teeth:) Reserve filling. Combine peanut butter, unsalted butter, whipping cream, and salt in a large microwave safe bowl. Heat in microwave on high for 30 seconds. Stir. Heat for 20 seconds. Stir. If butter is not completely melted, heat for 10 second increments, stirring after each, until melted. Stir in powdered sugar. The fudge will become very thick. I usually finish stirring in the powdered sugar with my hands. Stir in the reserved peanut butter fudge filling that you scraped out of the cookies. I know most buckeye recipes don’t call for heavy whipping cream, but I have been using it for a while and like how it effects the texture of the fudge. It is perfectly creamy. Don’t pack the powdered sugar into the measuring cup or you will have more sugar than needed. If this happens, your fudge can be come too thick and dry. To fix this, knead in a bit of heavy whipping cream until the mixture is malleable but still stiff. If your kitchen is very warm, you may need to refrigerate the peanut butter fudge for about 30 minutes before trying to mold it into the slipper shape. Place a fudge ball on one end of a cookie. Use your finger to press around the edge of the fudge ball and the edge of the cookie sealing the two together. Repeat with the remaining fudge balls. Use your finger or the end of a wooden spoon to make an indentation in each fudge ball. Pinch around the edge of the indentation creating the opening of each slipper. Grate 4 ounces of the pink candy melts using a rotary cheese grater. Pour grated candy onto a plate. Optionally, melt 4 ounces of pink candy melts and pour into a small rectangle or square plastic container. Freeze for 10-15 minutes then pop out of the container. Let sit for 10-15 minutes then grate using a box cheese grater. See the video tutorial for this method. Melt 16 ounces of pink confectionery coating/candy melts. 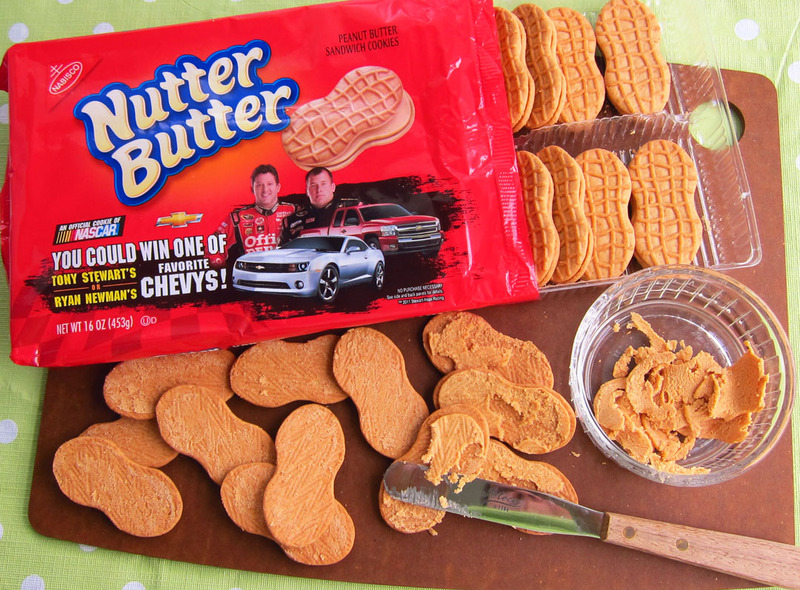 Hold onto a slipper cookie by the sides of the Nutter Butter. Dip the cookie, peanut butter fudge side down, into the pink candy coating. To ensure that the top of the cookie and the indentation get covered in candy, move the cookie back and forth a few times in the melted candy. Lift the cookie out of the candy melts and allow the excess candy to drip off. NOTE: I tried dipping the entire cookie using a candy dipping fork, but found that the slipper cookies are awkwardly top heavy and difficult to dip. Also, I ended up with misshapen cookies if excess candy pooled around the bottom. I thought they looked much better when the bottom of the cookie was not coated in the candy. Set the slipper cookie on the plate filled with the grated pink candy. Wipe your fingers on the paper towels because you will have candy coating on them. This is a messy job! Immediately sprinkle grated pink candy over the cookie, coating the entire thing. Let the cookie sit in the candy shavings for a minute. Then remove it and set it on a parchment paper lined baking sheet. Repeat, dipping and coating each of the slipper cookies. Freeze slippers for 5 minutes to set the candy coating. 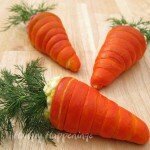 Remove from freezer and allow to come to room temperature before serving. These adorable little slipper can be made in a rainbow of colors. These adorable little brown slippers were dipped in tempered milk chocolate and sprinkled with milk chocolate shavings. Whether you use tempered milk chocolate or light cocoa candy melts, you can create these brown fuzzy slippers using the method above. You can see in this video tutorial how I melted and poured bright pink candy melts into a small plastic container, froze it, then grated it using a box grater. If your peanut butter fudge filling is soft and you are having trouble dipping the cookies in the pink candy melts, pop the cookies in the freezer for 10 minutes then try dipping them again. Sweet little Nutter Butter cookies topped with peanut butter fudge are dipped in pink candy coating then dusted with tiny flecks of the pink candy coating to look like a pink fuzzy slipper. Carefully split each cookie and scrape the peanut butter filling out into a bowl. Combine the creamy peanut butter, butter, cream and salt in a bowl. Heat in microwave on high for 30 seconds, stir, heat 20 more seconds, then stir and heat 10 second increments afterwards, if needed until melted. Stir in the powdered sugar then add the reserved peanut butter filling from the cookies. Scoop out 30 balls of fudge using a #70 ice cream scoop or spoon. Roll into balls and press into a slipper shape on one end of a Nutter Butter Cookie. Create an indentation in each peanut butter fudge ball making it look like a slipper. Dip the top party of a cookie in melted pink candy melts and immediately sprinkle with grated pink candy melts. 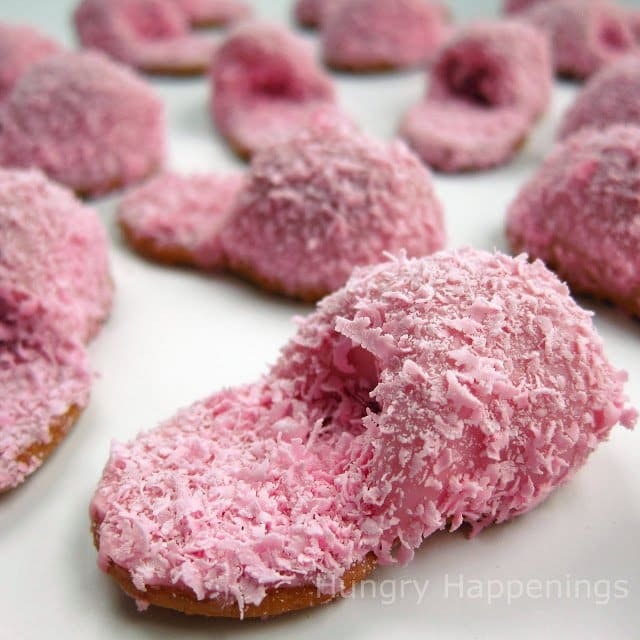 Have fun making these pink fuzzy slipper cookies for a slumber party, a baby shower, or for Mother’s Day. 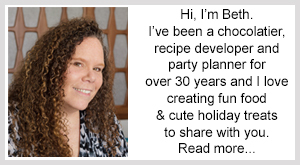 If you make these be sure to snap a picture and send it to me at beth@hungryhappenings.com so I can share it in my Readers’ Gallery and on social media. If you share your pictures online be sure to mention Hungry Happenings and link back to the this post and use the hashtag #HungryHappenings. 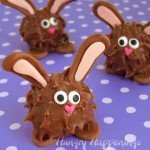 If you like making cute food you might also like these other cute treats. 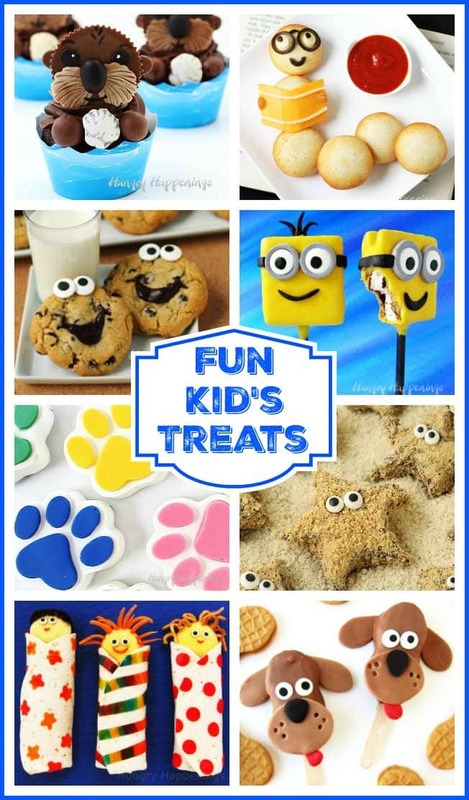 See the tutorials for all these cute treats on the Fun Kid’s Treats Page. Wooow…!!! this slippers are eatable.. it's soo cute..i never eat slipper in my life plz let me eat that…:P.. Your slipper cookies are really incredible cookie i ever see. Hi Beth. I am writing a post on fun food for kids and will be sharing and linking to this post for these adorable fuzzy slipper cookies. I saw that you are from Ohio too when you referred to our Buckeyes. I am in Columbus, how about you? I look forward to checking out the rest of your blog. Those would be fun too! I SAW THAT YOU MENTIONED THAT YOUR FRIEND HAD A RECIPE FOR FLIP FLOPS TOO!!!!!! I AM THE FLIP FLOP QUEEN & ALL ABOUT THE BEACH 🙂 COULD YOU SEND ME THAT RECIPE ???? PLEASE……. :) I AM LOOKING FORWARD TO MAKING THESE FOR MOTHER’S DAY & FATHER’S DAY!!!! GREAT IDEA!!!!!! THANK YOU AGAIN!!!! 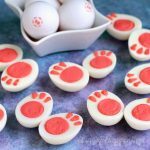 I hope you have a lot of fun creating these slipper cookies for Mother’s Day and Father’s Day! I know everyone will love this special treat.